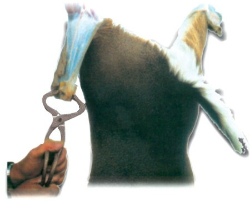 A great innovation in game processing and cleaning equipment, “The Claw” skinning tool is designed to make skinning game a breeze with its patented scissor type action and the toothed gripping ends that allow for easy work of skinning game. The large closed looped handles allow for one or two hand operation. The rigid construction of “The Claw” make it a durable and long-lasting tool that hunters everywhere will use for many years to come.